The Karnataka High Court released admit card for Civil Judge preliminary exam. Candidates who had applied can download the admit card from the direct link provided below. Earlier, it has released notification for the recruitment to 116 posts under Residual Parent Cadre and 08 posts under Local Cadre of Civil Judge. Aspirants who had applied can get the admit cards from here. Without admit card candidate is not allowed to write the examination. The exam is scheduled on 6th May 2016. The Karnataka High Court is the High Court of the Indian state of Karnataka. It is located in Bangalore, the capital city of Karnataka. Every year it releases notification for the recruitment of eligible and interested candidates in various departments. This year it has released notification for the Civil Judge posts and the candidates who had applied can download the admit card from the official website. The Karnataka High Court is going to conduct Civil Judge preliminary examination on 6th May 2016. A huge number of candidates who are looking for the jobs in Karnataka applied for these posts. All the candidates who had applied are searching for the admit card as it is the important document to carry for the exam and contains details regarding exam venue, roll number etc. Karnataka High Court released Civil Judge prelims admit card. Candidates who had applied can download the admit card from the direct link provided below. How to Download Karnataka High Court Civil Judge Prelims Admit Card 2016? 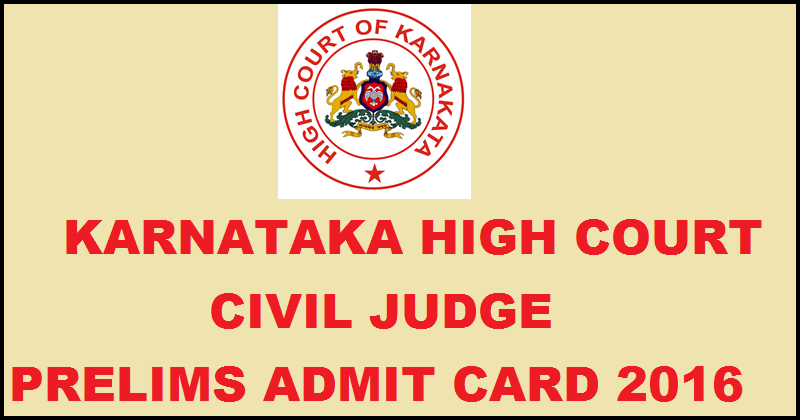 Click on Karnataka High Court Civil Judge Prelims Admit Card. Enter your application number & Date of Birth in the provided fields. Press CTRL+D to bookmark this page for easy navigation. Stay tuned to this website. We will update Karnataka High Court Civil Judge Prelims answer key, results etc.